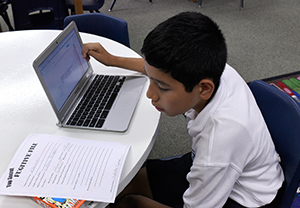 The Diocese of Phoenix coordinates a cycle of curriculum review, revision and implementation for all curricular areas. Our Lady of Mount Carmel utilizes these adopted curricula to direct day-to-day learning. Our core curriculum meets and exceeds the standards of other private and public schools. Students at Our Lady of Mount Carmel are taught religion, communication arts (reading, writing, Spanish, etc. ), mathematics, science, social studies, fine arts, and physical education. Through active learning strategies that promote decision making skills, problem solving techniques, and critical and creative thinking, students at Our Lady of Mount Carmel are encouraged to discover and develop their many talents.